If you're looking for a delicious pasta dinner, you'll love the smoky flavor of the fire roasted tomatoes and the crunch of pecans in this tasty meal. Place covered pasta pot filled 3/4 with water over high heat. Heat skillet over medium high heat, add olive oil and heat to shimmering. Saute shallots and garlic until soft and translucent. Add crumbled bacon, pecans, and green beans. Add freshly ground black pepper over the bean mixture, to taste. Stir to coat and incorporate, then add tomatoes and Vermouth. Bring sauce to a boil and cook on a high simmer (still bubbling) until most of the liquid has cooked out leaving a nice sauce. Turn off heat until pasta is done. Keep warm. Meanwhile, when pasta water boils remove lid and add Kosher salt. Add pasta and cook as package directs. Before draining pasta, reserve about 1/2 cup of the pasta water. Drain pasta, combine with sauce and bean mixture. Add some of the reserved pasta water if needed to moisten. 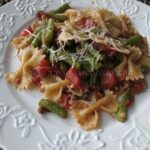 This recipe for Farfalle with Green Beans and Pecans in Fire Roasted Tomato Sauce was printed from AmandasCookin.com - https://amandascookin.com/farfelle-with-green-beans-and-pecans-in/ and can only be printed for education or personal use.